Ground anchors or earth anchors are strand wire anchors installed in the ground and prestressed to retain shoring structures. These structural elements can used in permanent as well as temporary structures. Ground anchors or soil nails can usually be provided in areas where the adjacent land is accessible or allowed to be penetrated by the anchors. In case where a ground anchor cannot be installed, struts are installed to provide the laateral support. Ground anchors can be removable as well as non-removable anchors. In areas where the anchors need to be removed due to any future sub-surface construction actvity for example tunnelling reomvable anchors can be removed. Shoring systems like piled wall or sheet piles are usually aided by ground anchors as a lateral support. 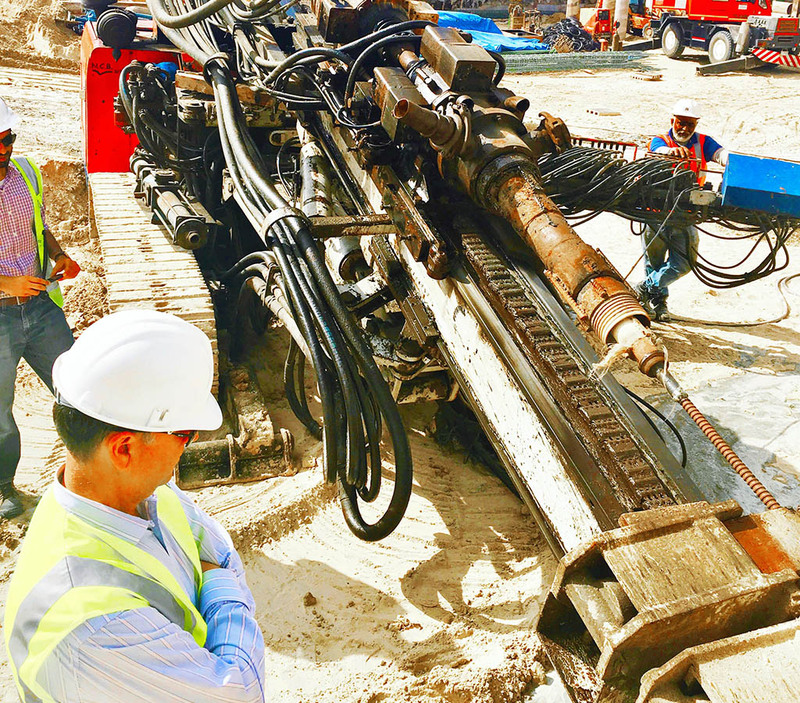 These ground anchors are drilled to the required depth exceeding the failure envelope of the soil mass and then anchored in the soil to prevent the soil failure. A ground anchor typically involves the drilling of a 150mm diameter bore hole, homing of a strand wire/rebar anchor assembly followed by grouting and then stressing and locking off at the required load the anchors are designed to bear. Anchors can be temporary or permanent, removable or non-removable depending on their utility. – The anchor head, transmitting the anchor force to the shoring structure through a bearing plate. – The free length of tendon, from the head to the near end of the anchorage covering the failure zone of the soil mass. – The grouted anchorage, which is the length of tendon by which the tensile force is transmitted to the surrounding ground through the grout. 1. Failure of the soil mass form the slip failure plane. 2. Failure of anchor strand wire due to tension. 3. Failure of of grout anchor bond. 4. Failure of soil grout interface bond. 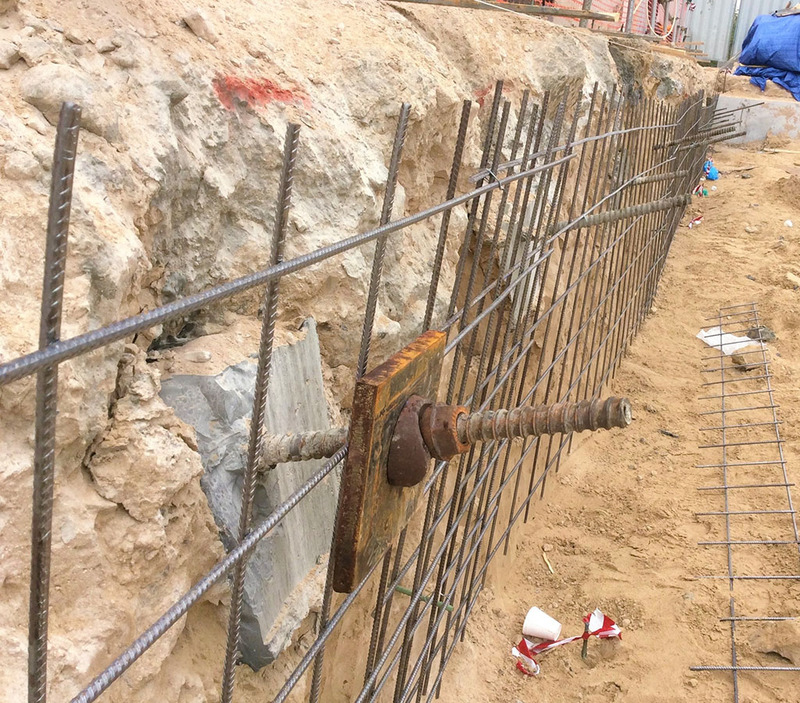 Soil nails or rock bolts offer a method of securing excavations, slopes or embankments by installing reinforcement bars through and into the failure zone. Soil nailing usually involves the insertion of reinforcement bars (Hollow/solid) into the exposed slope followed by grouting, placement of a wire mesh and shotcreting before the testing and locking off of the nail through stressing jacks. Hollow soil nail bars can also be self-drilling thus acting as drilling rods with expendable drill bits. Soil nails are cost effective for stable soils where water pressure is not an issue and for excavations where space is a constraint. b) Install the 1st layer of soil nail. 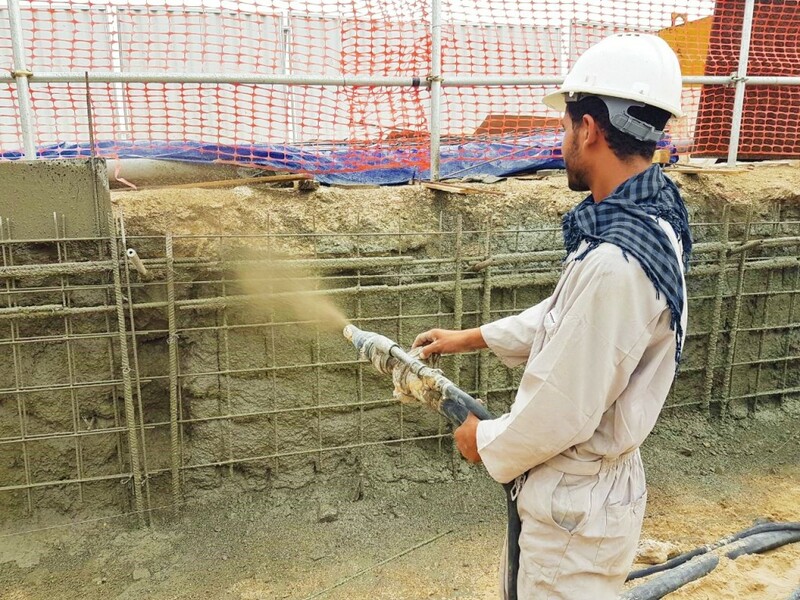 c) Apply first phase shotcrete on soil face with wire mesh or other reinforcement if required.